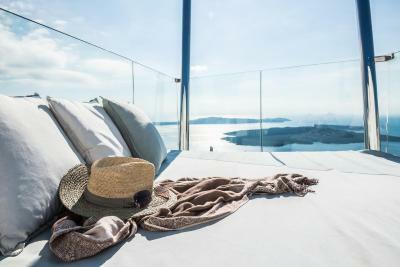 Lock in a great price for On The Rocks - Small Luxury Hotels of the World – rated 9 by recent guests! The view is to die for The property is really nice The staff is friendly The rooms are bigger than average in that price point The breakfast is served on your private balcony overlooking the sea, it's one of the best breakfast I have ever had and with the view it makes it even more special PS: I highly recommend the open-air movie theater / restaurant in Fira. We saw Mamma Mia! there and it was a dreamy experience. 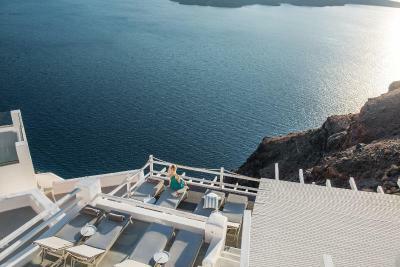 Beautiful hotel with amazing views over the Caldera. The rooms were actually nicer than we had expected. Lovely design, a wonderful balcony and decent size room and bathroom. 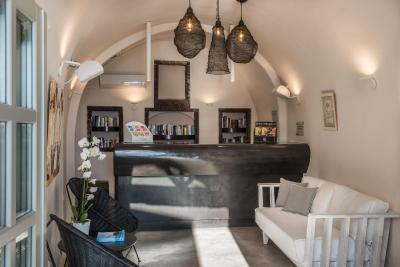 The staff were wonderful and the pool / bar area is great for relaxing with a book and glass of wine. The staff was extremely kind and helpfull. Breakfast is great. The whole atmosphere was amazing. Everything was amazing! The staff, location, room! They also upgrade our room! Love it!! Breakfast serves is hands-down amazing. Plus the view is gorg. Proximity to bus stop is also ideal. Good breakfast, prime location, walking distance to many good restaurants. Staff extremely friendly and helpful. 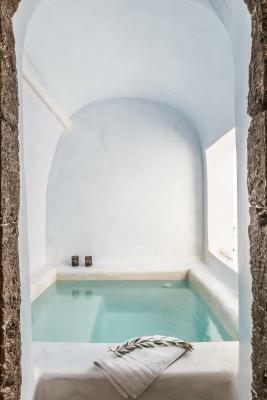 Beautiful cave style with modern updates. Shower had two rain shower heads. Quiet area with amazing caldera and sea views. The view of the caldera was like no other. Room service breakfast was perfect for the sunrise. 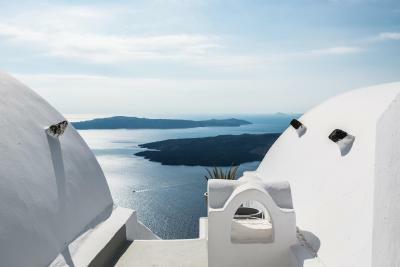 On The Rocks - Small Luxury Hotels of the World This rating is a reflection of how the property compares to the industry standard when it comes to price, facilities and services available. It's based on a self-evaluation by the property. Use this rating to help choose your stay! 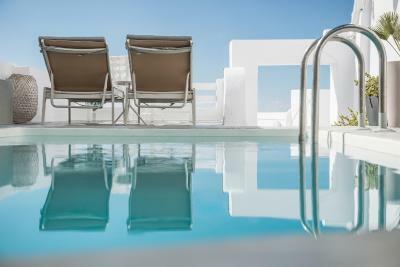 On The Rocks is ideally located in the famous village of Imerovigli. 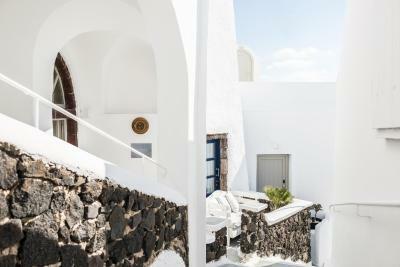 It is only 1.2 mi from Fira town and built on the steep rocks, 650 feet from the Caldera basin. 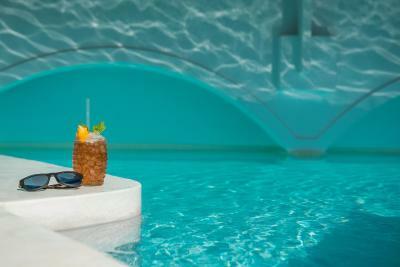 Next to the swimming pool you may enjoy your favorite cooling drinks, cocktails, light snacks and delicacies. Tavernas and restaurants are only 650 feet away, while the bus stops at 100 feet. 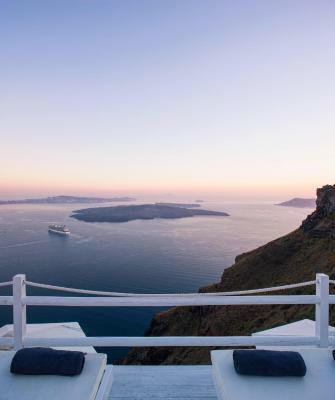 The distance from Santorini Airport and Port is 5 mi. Oia is 6.2 mi away and the closest beach (Kamari or Monolithos) is 6.2 mi away. When would you like to stay at On The Rocks - Small Luxury Hotels of the World? 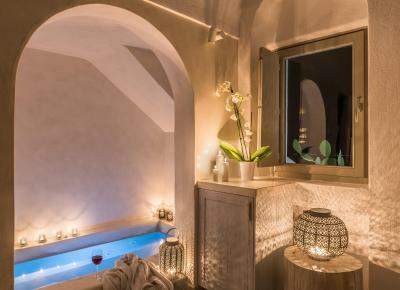 Elegant suite featuring a luxurious bedroom, comfortable living area, indoor hot tub and veranda with stunning Caldera views. 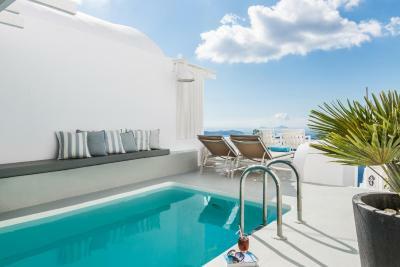 Stylish suite featuring a comfortable bedroom, living area and veranda with amazing sea views. 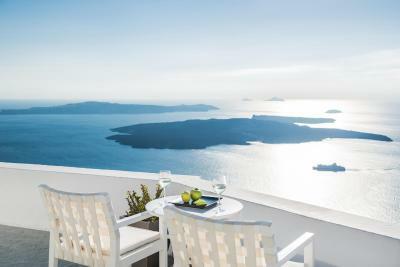 Elegant room with veranda with splendid Caldera views. Master Suite with Caldera View and outdoor private pool. Please note that the 5th and 6th person are accommodated in a double bed. 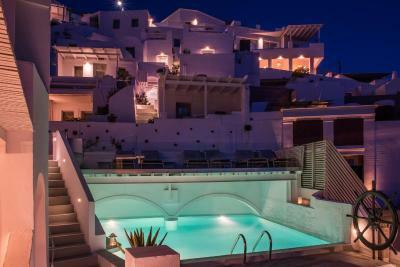 On the Rocks hotel is one of the most romantic hotels in Imerovigli, promising to offer you the most of your stay with us. Being a proud member of the Small Luxury Hotels of the World, On the Rocks knows better than anyone what personalized service means and is ready to offer it to you. 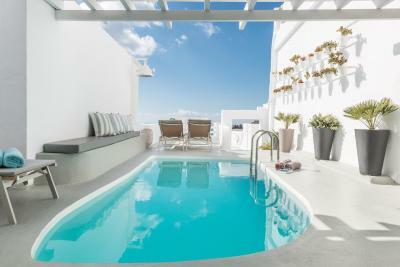 House Rules On The Rocks - Small Luxury Hotels of the World takes special requests – add in the next step! 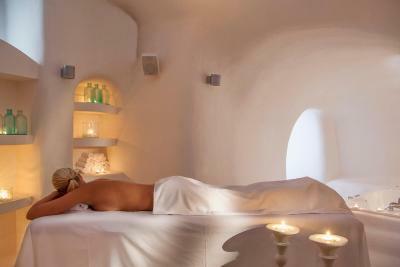 Any additional children or adults are charged EUR 90 per night for extra beds. On The Rocks - Small Luxury Hotels of the World accepts these cards and reserves the right to temporarily hold an amount prior to arrival. On the Rocks is not suitable for children due to its location as well as its lack of children’s facilities. Children must be over 13 years old and are welcome under their parents’ strict supervision. Kindly note that for group reservations of more than 3 rooms, different policies and additional supplements may apply. Please note that baby cots are not available at the property. Food has deteriorated at the hotel. Last year we enjoyed many pool side lunches and room service offerings, and breakfast was always excellent. This year we felt the food was the only bad aspect. Breakfasts were just not their usual standard and so we ordered bare minimum of room service. Sorry! Exceptional staff and accommodation- loved it all! 1. for being a small luxury hotel, i expected the staff to be a lot more pleasant/polite. maybe due to the fact that i stayed at the property few days before they closed for the season most of the employees are exhausted from the busy summer, but of course that is not an excuse. 2. when they served my breakfast on the first morning, there wasn't any napkins provided. when i asked for one from the hotel staff, he told me to call the restaurant number even if he was on his way down to the restaurant. then he also told me why don't i just use the kleenex provided in my room. i was shocked to hear this. i asked a second person but he never came back with one. i relayed this to the receptionist the following day and she stated it should have not happened like that. the manager, did not let me pay for one of the meal i ate in their restaurant because of this incidence. they also had the staff come to my room to ask for an apology. which was a nice gesture but an apology would have not been warranted if they just do their job right. 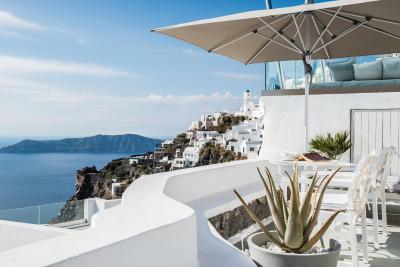 1. location was amazing of course as it is located right on the cliff with commanding views of the caldera. 2. property is not so huge and easy access to the main road. 3. they can provide breakfast either on your private patio/balcony or at the small restaurant (you just have to sign up the night before the time you want it but also depending on the availability) 4. wifi worked just fine. The only thing is that it's quite far from Fira. We wanted to eat at different places for every meal so it would be 30mn walk each way every time. It is not such a big deal as the walk is actually very enjoyable with a panoramic view. But worth mentioning if you don't intend to walk too much. 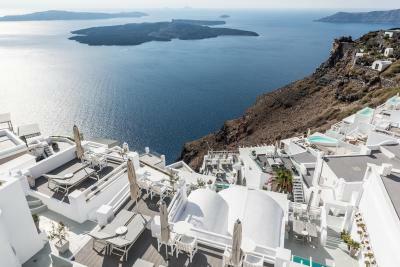 My recommendation would be to stay at this hotel first for a few days, then move to Oia.. this way you have the best of both worlds and you can have very different experiences in both places. While the room was clean, we were not sure if the towels/bathrobes were changed, or simply folded and placed back on the bed. It would be good to have a practice similar to most hotels, i.e., if guests place the towels on the racks, it means they want to re-use it, and if guests place it in the shower, it means they want it changed. Staff were responsive to emails in the lead up to the stay. The views from the hotel were excellent, and we like the privacy of our room and balcony. It was a nice touch to be able to select where we wanted to have our breakfast - poolside or room balcony. The service team were good, and kudos to the staff who climb those stairs multiple times a day, especially in the mornings, to deliver breakfast to the various room. We were upgraded by the hotel and got a special room with Jacuzzi. Staff was polite and helpful. Location of the property was fantastic and the view unbelievable. We had an incredible stay, just for one night whilst all ferries were cancelled off the island so we had an additional night in Santorini. 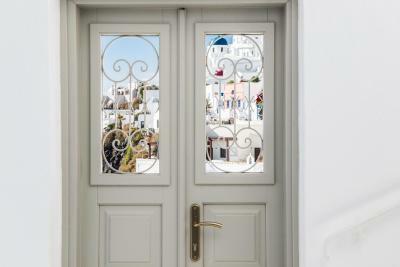 The location is PERFECT, close enough to be able to find some lovely bars and restaurants, but away from the heavy tourist masses of Fira. The view from the terrace in front of our room was spectacular, and we were lucky enough to be upgraded to the honeymoon suite for the night, which was fabulous! Thank you On The Rocks for an unforgettable travel experience. The very unpleasant smell in the wardrobe of room 23. Old and soiled bed sheets, towels and robes. We had an excellent stay at On the Rocks. I would highly recommend to anyone and I look forward to staying again one day. Excellent central location, beautiful view, very peaceful and relaxing. Very helpful staff who organised a lot for us with no troubles.